After discussing the avalanche method of paying of debt last week, I want to share with you another method to pay off your debt that has been popularized by many – the snowball method. This another fitting name with the cold weather and snow we have been having around here though. Using the debt snowball method we will largely ignore the interest rates on loan and debt balances and focus on paying off the smallest balance first. You then pay off the next smallest balance once that debt is paid off, and continue on the same payment pattern going forward. The focus on using the snowball method to pay off your debts is more of a psychological strategy as opposed to a numbers strategy, though there are places where the numbers do end up coming into play. If you are a person who is analytical and wanting to save every dollar (like me!) 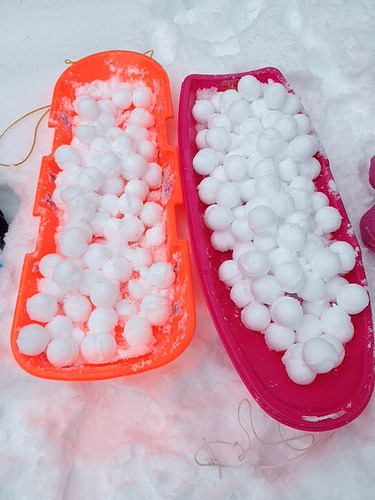 the snowball method of debt may be confusing to you at first. Why would I want to do this when I can save X amount of dollars using the avalanche method instead? Well one of the reasons that this method is so popular is that when you are paying off debt for many months or even years, it becomes a tiresome journey. It’s not only a numbers game as much as the psychological burden really takes its toll on you. Many people are very goal-oriented and enjoy seeing the progress of meeting these goals sooner rather than later. The snowball method fits perfectly into this category and helps to motivate to pay off your debts. Which situation is better? A person that is struggling using the avalanche method to pay off a huge loan balance and giving up entirely or moving back to minimum payments? A person that is using the snowball method allowing them to stay motivated and stick to their plan of paying off their debt? Hopefully you picked option 2 at the better situation! Obviously situations aren’t really as clear-cut as that example in real life, but it should illustrate the point I am trying to make. Sticking to your repayment from an overall perspective is much more important than saving a few hundred dollars. If you are able to do both, that is great. But if you are struggling with this you may want to consider switching over to the snowball method of debt. With the snowball method you can potentially optimize your numbers as well, and even though it might not as perfect as the avalanche method you can still save money on interest. If you have one loan at a $8,000 balance and a 9.5% interest rate and then another loan at a $7,000 at 5.5% in that case I would pick the $8,000 to target as your first loan to pay off. You’ll still end up with a relatively quick “win” and you’ll also save by paying off the higher interest loan first! Another situation where the snowball method is extremely useful if you are in a situation where you are only able to make minimum payments or slightly over minimum payments. Either that or a situation where the extra cash flow of removing a minimum payment would help you out elsewhere. If your total minimum payments are $500 a month and all of a sudden that’s reduced to $440 a month, that $60 can be put towards building up an emergency fund instead. In real life this can be much more valuable to a person compared to saving a few dollars in interest. So to summarize, the snowball method is very easy to follow. You put the most of amount of money you can towards your smallest debt but still make sure to pay the minimum payments on the rest of your loans. Once you pay off that first debt, you shift the extra money towards the next smallest loan and so on until you’re debt free. This creates a “snowball effect” in that the extra money you put towards those loans is kind of like a snowball rolling down a hill gathering more and more snow! I personally feel that there isn’t a one size fits all payoff debt plan and people should choose a plan that best works for them. I also believe the snowball effect gets a little too much credit for depending on the types of interest you are consuming on a daily monthly basis, it might be smarter to attack high interest debt while still paying the lower ones off. So I totally agree with you in this case. The hard part is staying motivated and what I do is keep my eyes on the big picture. Just thinking about living a debt free life for me makes me feel so warm and fuzzy on the inside. I fully agree that there isn’t a one size fits all solution. I myself have flip-flopped between the two methods at times. It really depends on the person, but I do personally think going after the highest interest is the best way to go about it if you can. I just found your blog. I have about $36,000 in loans at the moment. Most of them are over $8000, but I have one that is $1300. 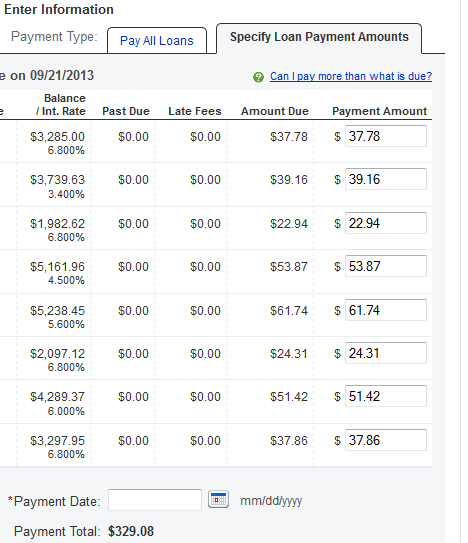 I have Fed Loan Servicing and I didn’t even know I had the option to pay off one specific loan at a time!! Your blog is a great resource. I think I’ll do the opposite of the snowball, and tackles the high interest ones first. I’ve just been applying a $422/month payment to all of them, which I don’t think is getting me anywhere really. Thanks so much! Thanks for stopping by, glad you found my blog and it was of some help to you. The opposite of the snowball method is using the avalanche method to pay your highest interest loan off first. That is mathematically the most effective way to pay off your loans! And yes you can put extra towards an individual loan, and paying over the minimum will help you make some real progress. You can increase any of those amounts to over the minimum payment amount if you want to specifically target them. Make sure you have your “paid ahead status” removed though, or else next month it’ll show a payment of $0 for that loan. Either that or keep track of it and make sure you still make your payment the next month.